Habit: Annual, hairy. Stem: 4--40 cm. Leaf: lobes 2--18 mm, narrowly obovate to linear, tip of middle lobe acute. Inflorescence: head; flowers closing at night. Flower: calyx 4--10 mm, densely hairy, glandular, membrane obscure; corolla salverform, tube 11--46 mm, thread-like, maroon, pink, or yellow, throat yellow, purple, or orange, lobes 4--8 mm, elliptic to oblanceolate, pink, white, yellow, or purple, often with red marks at lobe bases; stamens exserted; stigmas 1--7 mm. Chromosomes: 2n=18. Synonyms: Leptosiphon laetus H. Mason; Leptosiphon luteolus (Greene) H. Mason; Leptosiphon luteus (Benth.) 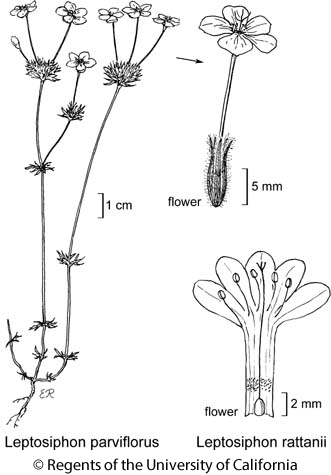 H. Mason; Leptosiphon micranthus (Steudel) H. Mason; Linanthus androsaceus (Benth.) Greene subsp. laetus H. Mason; Linanthus parviflorus (Benth.) Greene; Linanthus plaskettii Eastw. Citation for this treatment: Robert Patterson & Robyn Battaglia 2012, Leptosiphon parviflorus, in Jepson Flora Project (eds.) Jepson eFlora, http://ucjeps.berkeley.edu/eflora/eflora_display.php?tid=80366, accessed on April 19, 2019. CA-FP. Markers link to CCH specimen records. Yellow markers indicate records that may provide evidence for eFlora range revision or may have georeferencing or identification issues. Purple markers indicate specimens collected from a garden, greenhouse, or other non-wild location.